Eliud Kipchoge, the humble farmer from the Rift, just SMASHED the World Record by a cool 1min 18secs. Its the biggest improvement in marathon record over the last 50yrs. Its also his 3rd win in Berlin. Its a 1,2,3 win in the mens race. Widely regarded as the greatest marathoner of all time, Kipchoge ran a time of two hours, one minute and 39 seconds to beat Dennis Kimetto’s world best of 2:02:57; set in Berlin back in 2014. 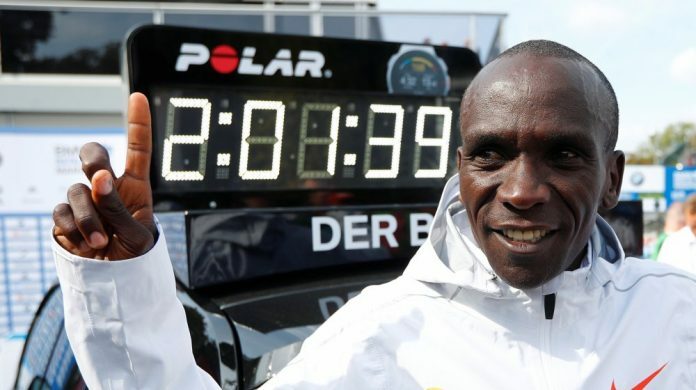 For 33-year-old Kipchoge, he will be walking away with over Ksh.10 million from the Berlin Marathon not to mention other prizes from his sponsors. An additional prize of around 69,000 USD (Ksh.7 million) is also up for grabs to the champion who sets the world’s best time.